There was an old woman who lived in a shoe. She had so many children, she didn't know what tot do. She gave them some broth without any bread, then took them to live in a new home instead. Too messy, too woolly, too noisy, too small. Whether it's Humpty Dumpy's wall of Mother Hubbard's cupboard, the old woman and her children just can't seem to find a new place big enough for their growing needs. An orignal take on some favorite nursery rhymes - this is one search for a new house that's bound to be more pleasure than trouble. The hunt for the perfect abode is the premise for this romp through the world of nursery rhymes. 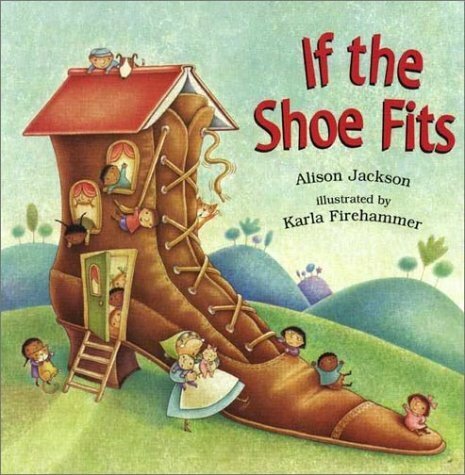 Jackson retains the rhyming pattern of The Little Old Woman Who Lived in a Shoe thorughout the family's adventures, providing stability to their leaps around the various tales. "There was an old woman who lived in a shoe" begins this clever story along the lines of the Ahlbergs' Jolly Postman books. Jackson's deft touch for humor carries the audience's interest through the story. In a takeoff on the nursery classic about the old woman who lived in a shoe, Jackson sends the mom and her little ones on a wild-goose chase to find a house. Winsome acrylics keep pace with the clever rhymes.